The Keeshond was named after an 18th Century Dutch patriot of the patriotten (rebel) party in Holland named Cornelius De Gyselaer whose nickname was Kees. His little dog became the mascot of De Gyselaer’s party, and his followers were derisively referred to as Keezen by the opposing party. The Keeshond became a symbol of the rebel party, and the breed became popular among the ordinary people. The Keeshond is first and foremost a devoted friend to their family. They were bred more as a companion than a hunter or watchdog. 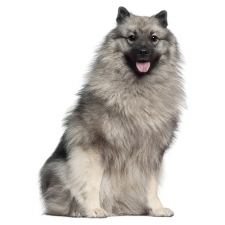 The Keeshond is full of personality and loves to share their enthusiasm with everyone, often spinning in circles. Affectionate, cheerful, even-tempered, and friendly, they enjoy being part of a family and love adults and children alike. They are very intelligent and train easily. The Keeshond is a bit more mellow and easy to live with than other spitz-type canines. The Keeshond usually weighs between 50 to 65 pounds and stands approximately 16 to 19 inches tall. They are a medium-sized dog with a stocky build. The Keeshond's thick double coat is usually gray and black. Other names the Keeshond goes by are: The Laughing Dutchman, Wolfspitz, Chien Loup, Gernam Wolfspitz, Kees.